Voce del popolo is a new feature dealing with the Italian peninsula and everything surrounding its beloved calcio. One account, many voices. This recipe is not the recipe for success; it’s the recipe for mediocrity. For the bare minimum. It creates draws against Milan, Lazio, Palermo, and Fiorentina, opening a seven point gap at the top in the process. To be fair, it’s hardly a world-class recipe. Just look at the steps – they’re pretty simple, they don’t require all that much, and you could hardly expect filet mignon from a list of ingredients that doesn’t include the finest cut of beef. But after a while, you start to question the chef. Surely, the chef must know that the proper ingredients have to be mixed, cooked, smeared, flavored, added, boiled, heated, seared, and flared at just the right moments. Surely, the chef knows the ingredients he has at his disposal (It could be a female chef but it isn’t in this particular case; this isn’t sexism, just a terrible veiled metaphor). �Surely, the chef should realize that this recipe isn’t working and has to fix it. And yet, here we are. Four draws all featuring the same formations. Different players, at times, certainly – these were the ingredients in the analogy, for those not paying attention – but oddly stubborn nevertheless. 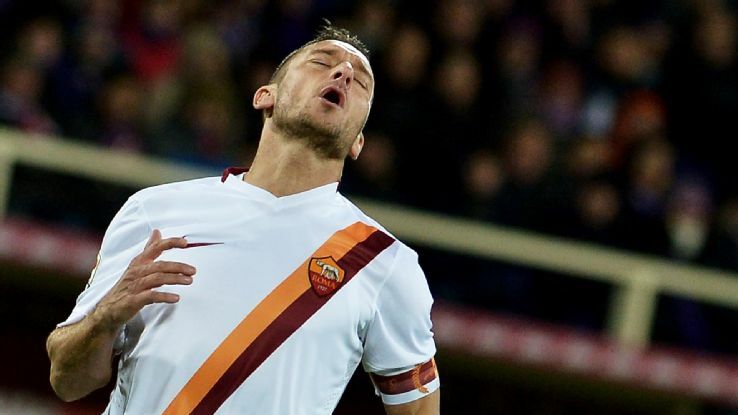 Fine, Davide Astori played because Kostas Manolas was injured, and Seydou Keita and Gervinho are off at AFCON. That’s fair. But what about �Leanro Paredes? How about the talent of Salih Ucan – has he not done enough to warrant just a few more minutes? Has Mattia Destro truly been so bad that he barely even deserves to start anymore? Has the formation been so successful that tinkering is unwarranted? Sticking with a recipe only works if it’s world class; Barcelona could trot out a 4-3-3 and win the treble because it was perfectly harmonious, because brilliant individual skill could compensate for teams that knew what was coming and could prepare for it anyway. Roma has neither the harmony nor the individual flair; fewer match-winners and less chemistry plus a rigid system hardly equals bountiful success. Of course, the bigger issue here is that there is no one recipe for success; otherwise, every team would be doing it, rendered it null and void, and thus not effective. In general, it seems rotating a squad carefully throughout the course of an ever-lengthening season is often considered necessary for winning teams, but there are quite a few teams that seem to stick with the same 11-14 players in most of their matches and do just fine. Jose Mourinho, for example, advocates this policy and is one of the most winning coaches in the game; meanwhile, Pep Guardiola spent his last season at Barcelona tinkering with the notion of using no traditional forwards whatsoever and likes the stir the pot as much as possible, throwing Philipp Lahm in the middle, David Alaba here-and-there for good measure, Manuel Neuer as the eleventh outfielder rather than where a traditional goalkeeper would be expected to stay. The examples are endless. “Traditional number nines guarantee success,” the people claim, and point to Diego Costa, Diego Milito, and David Trezeguet, to use three sterling examples with fantastic alliteration, as proof. Yet, Manchester United featured a four headed roaming quartet of Wayne Rooney, Cristiano Ronaldo, Carlos Tevez and Nani late last decade, stolen shamelessly from Luciano Spalletti and Roma itself after stealing the side’s dignity and respect in the Champions’ League the season before (because Manchester United don’t just take your lunch money, but they sleep with your girlfriend and brag about it in the hallways, too). Full-backs are supposed to contribute to attacking and defending, but not at the same time, and in careful consideration; Dani Alves is good, Jordi Alba is good, but put them on either side of two centre-backs, and you’re asking for trouble. Deep lying playmakers are supposedly a thing of the past, but Andrea Pirlo and Xavi are two of the most successful players of the last decade; Bayern’s spine includes an irreplaceable Xabi Alonso; Real Madrid utilize Luka Modric to great effect; the heartbeat of Mourinho’s Chelsea side is a Cesc Fabregas that has partnered delightfully with Nemanja Matic in the centre of the pitch. In short, there’s no one recipe for success; there are many, and Roma had their own very effective one just last season. But that was then; this is now; the recipe once so bold and original is coming off a little stale and trite, like having ice-cream ten days in a row; it’s still ice cream, and you still love it, but maybe it’s time for something else.